Refracting and reflecting telescopes are used to collect and study visible light. Although visible light provides valuable information, it only represents a tiny portion of the electromagnetic spectrum. To see the rest of the spectrum, which consists of invisible colours, researchers need to use collectors that are capable of detecting wavelengths that correspond to the type of light they wish to study. For the infrared domain, the parabolic mirror of a reflecting telescope remains the ideal means by which to collect and concentrate the light rays. Because the light being collected is invisible, the human observer is replaced by an infrared detector at the mirror’s focal point. Its purpose is to measure the intensity of the infrared rays. The technique works very well for infrared waves with short wavelengths of about 2.5 microns, or 2.5 millionths of a metre. This portion of the electromagnetic spectrum is known as “near-infrared” because the waves are nearest to red light. Unfortunately, the situation is considerably more complex for the mid- and far-infrared domains. One of the complications for detecting infrared sources in space is that the reflecting telescope collects a lot of background infrared light from the atmosphere, from any human observers present in the room, and from the telescope itself. This occurs because objects emit infrared light at about 20 °C. In addition, atmospheric water vapour absorbs a large part of the infrared rays coming from space, which makes data collection difficult – or even impossible – at some wavelengths. To overcome these problems, detectors are cooled to very low temperatures (sometimes down to -269 °C) and the telescopes are placed at the highest elevations possible where the air is drier. Another solution is to put them directly into space, orbiting Earth. The great interest for astronomers in observing the infrared light of the Universe is due to its powers of penetration. Infrared waves are capable of passing through dust, allowing us to see regions that are otherwise impenetrable to visible light, such as the interiors of nebulas. 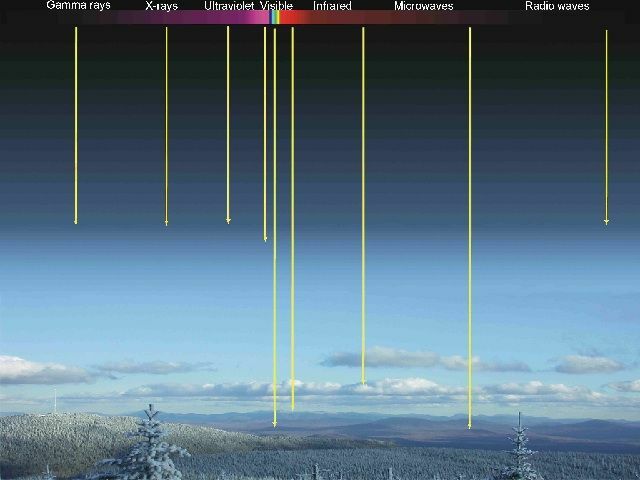 At longer wavelengths in the microwave domain, absorption by water is a persistent problem and the best solutions are to collect data from high elevations or satellites. Luckily, there is a technical advantage to working with microwaves: their wavelengths are sufficiently long enough that a metal parabolic collector can be used instead of glass. The reason it is possible to use metal is quite simple. In order for light rays to be concentrated at the focal point of a reflecting telescope, the size of the irregularities in the curve of the parabolic collector must be smaller than the wavelength of the light being collected. Consequently, it is not necessary to use a highly polished reflecting surface like a mirror for light with very long wavelengths, like microwaves; instead, a simple metal dish will suffice. Microwaves are of immense interest to astronomers. 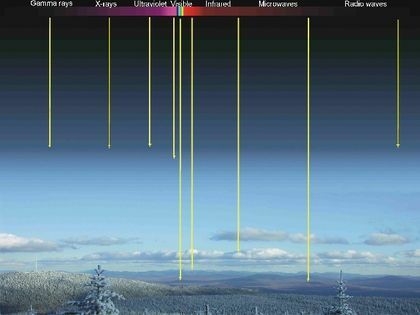 Cosmic background radiation – that amazing “first light” emitted when the Universe was only a few hundred thousand years old – exists mainly in the form of microwaves. 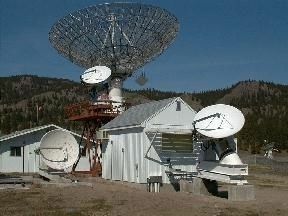 Radio waves, which have even longer and less energetic wavelengths than microwaves, are typically collected using large metal dishes. The Earth’s atmosphere allows for the easy passage of wavelengths measuring 1 centimetre (the beginning of radio waves) to 10 metres. This is true even if the weather is overcast, which allows astronomers to have virtually continuous observation of this portion of the electromagnetic spectrum. Radio waves are produced by supernova remnants and by electrons passing through the magnetic fields of distant radio galaxies. For light with wavelengths that are shorter than those of visible light, like ultraviolet rays, it is possible to use optical telescopes. Unfortunately for astronomers (but fortunately for human beings), most ultraviolet light is absorbed by the ozone layer before reaching Earth’s surface. It is therefore necessary to use satellites for ultraviolet studies. Ultraviolet light is the most abundant type of energy generated by very hot stars. Satellites must also be used to study X-rays and gamma rays, which have wavelengths that are even shorter and more energetic than those of ultraviolet rays. These light rays are so energetic, however, that they can easily pass through mirrors; special collectors must be used to detect them. Most X-rays are emitted by pockets of hot gases found between galaxies and near black holes. Gamma rays are mainly found in the vicinity of supernova explosions.